Photo by: David Jacobs, 2012. During the eighteenth and nineteenth centuries, small, but viable Jewish communities existed in Cornwall, principally in Falmouth, Truro and Penzance. From the mid-nineteenth century, however, these communities began to dwindle. By 1880, as the Jewish population of Falmouth continued to fall, the synagogue that they had established in 1808 on Smithick Hill overlooking the harbour was closed, although the building still stands. Falmouth’s historic Jewish Cemetery was established here in the early- to mid- eighteenth century, around the same time as the adjoining Congregationalist Cemetery, on land granted to both religious communities by Sir Frances Basset, Lord de Dunstanville. Visitors to the Cemetery. Photo: By Anthony Fagin 2013. 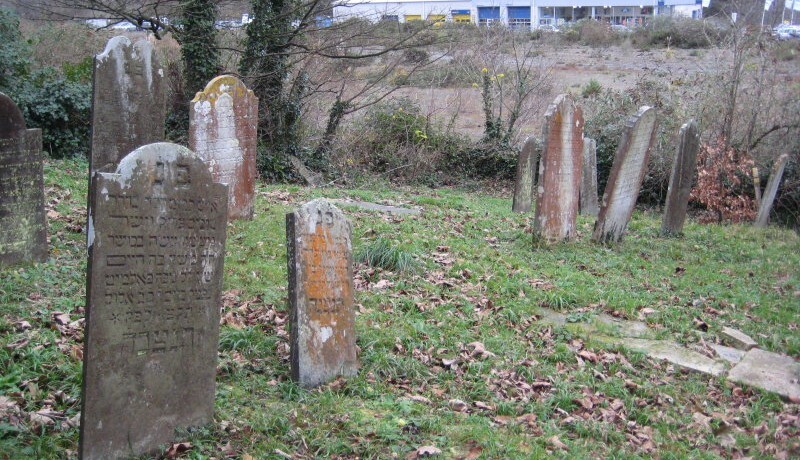 In the entire UK there are only about twenty-five surviving Jewish burial grounds that pre-date the early nineteenth century, of which seven are to be found in the southwest. The first Jews to settle in Falmouth arrived in the 1740s, encouraged to settle by one Alexander Moses (1715-1791), known as Zender Falmouth. He is buried here. 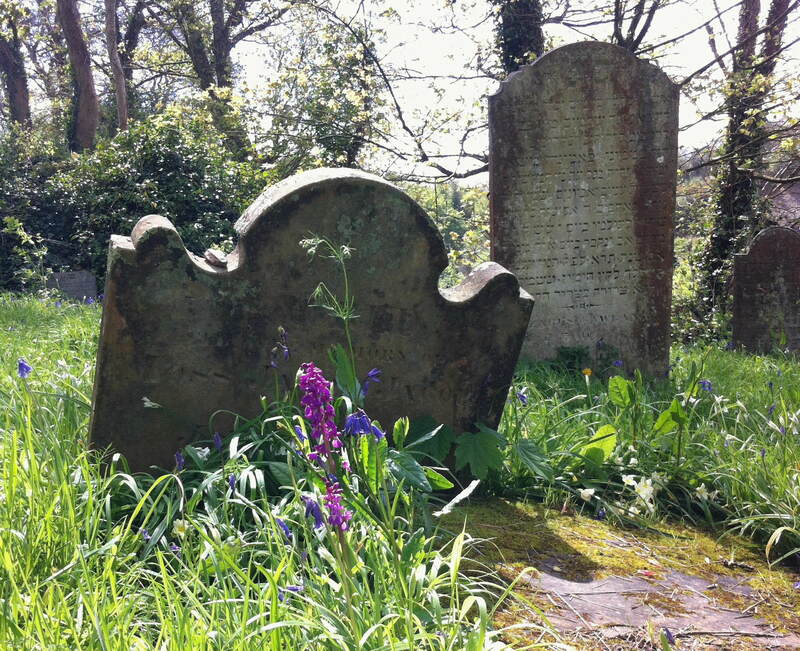 The oldest surviving Jewish headstone in this cemetery, and possibly in all of Cornwall, was discovered recently. Uniquely it is made of granite and although the inscription is no longer decipherable, it is thought to belong to Esther Elias who died in the late 1780s. There are almost certainly earlier burials here dating back to the1750s perhaps, but in unmarked graves. Headstone inscriptions dating from before 1838 are exclusively in Hebrew with dates written according to the Jewish tradition. Later headstones also incorporate English with secularised dates. Well over two hundred people passed through the Dissenters and Jewish Cemeteries at Ponsharden in Falmouth on Sunday, the 10th of September to learn about their historic roots and the people who are buried there. Sponsored by The Friends of Ponsharden Cemeteries, the event was held in conjunction with the European Days of Jewish Culture and Heritage and National Cemeteries Week. Restoration is currently underway led by The Friends, the Falmouth Town Council, and Historic England. An application to the Heritage Lottery Fund has been submitted to raise the necessary additional funds. On hand to guide people through the site were Keith Pearce, local historian and authority on Cornish Jewry, Rob Nunn and Tom Weller, experts on the adjacent Dissenters’ Burial Ground, members of The Friends, and Anthony Fagin, custodian of the Jewish Cemetery. Headphones were provided which contained an audio trail to introduce people to the lives of some of those people buried there created by Ruth Mitchell and Derek Frood of the Ripple Theatre. Of special interest, was a visit by Kathryn and Elliot Berman from Israel, to visit the graves of Kathryn’s ancestors. Kathryn is a 7th generation direct descendant of Esther Elias who died in 1780. Her burial with an unusual granite headstone is believed to be one of the oldest recorded Jewish burials in Cornwall. Also buried there are her husband, Barnet Levy, as well as some of their children and other members of that family. 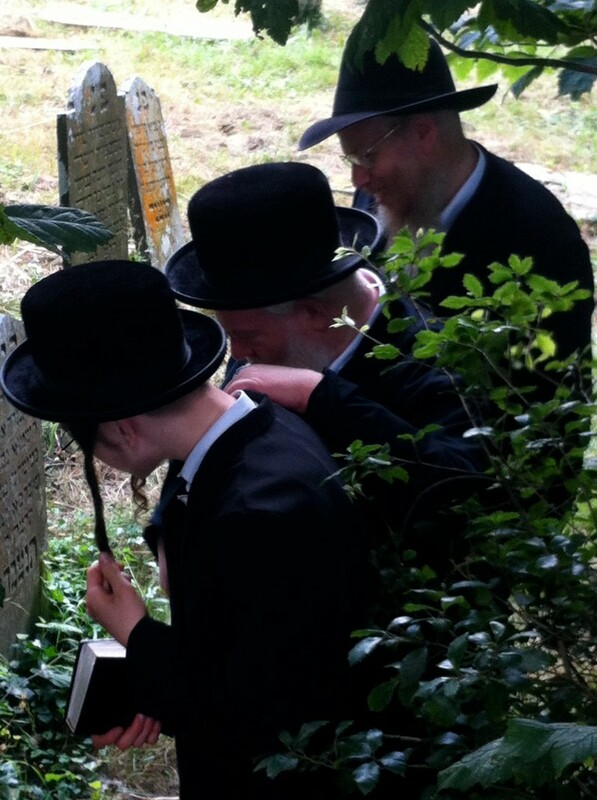 A special Kaddish was said for the Bermans as well as other memorial prayers. Historic England has created a list of the 100 places, buildings and historical sites that tell the remarkable story of England and its impact on the world. To visit their web site and view the details click here.